Aah May in Noosa. The days are clear, the sun kisses the skin and the breeze is cool and mellow… perfect for tasting all the wines and eating all the foods at the Noosa Food and Wine Festival! The Festival, held in the middle of May each year has grown in reputation and popularity, with cheffing royalty, hatted restaurants, top shelf wineries and local producers all clamouring for space in what is an exceptionally well run series of events. From a wander through the Festival village with the family, to gastronomical degustations under enormous bell tents on the sand at Main Beach, to tours of hinterland producers beating the Slow Food drum, there really is something ridiculously yummy for everyone! 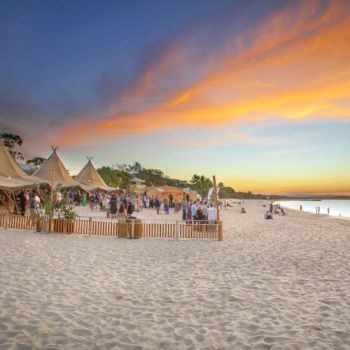 For Noosa Crest guests, the Festival is an absolute must with the Village located in the Lions Park over the weekend, just metres from our private boardwalk and a spectacle of coastal chic design and hedonistic cuisine. A day spent sipping through a swathe of wineries and microbreweries can be perfectly paired with small gourmet plates from numerous high-end Noosa restaurants like XO Embassy and Boardwalk Bistro. There are also cooking demonstrations, wine tasting classes and a tent full of producers looking to spread the good word about their award winning fare. Top the day off with fantastic live music and a glorious sunset over the Noosa River. The Village is child friendly with lots of room to move on manicured grass, amongst comfy bean bags and some seating. A day at the Village is certainly a full day’s worth of entertainment, though treating yourself to one of the Noosa Food and Wine Festival events is a luxurious experience in delighting every sense. Set in some of Noosa’s most lauded restaurants and featuring the likes of Alla Wolf-Tasker, Neil Perry and Matt Moran to name just a few, events showcasing the produce, techniques and sheer skill of Australia’s best chefs are an amazing culinary journey; and there are plenty to choose from. There are beach parties, boozy breakfasts and lunches devoted to just about anything: Australian bush flavours and foraging techniques anyone? Just pick one and let your senses (especially the ones in your mouth) be gastronomically transformed. These events sell out quickly, so book your preferred experience and your Noosa Crest accommodation well in advance. Seating is limited within the Festival Village, wear comfortable shoes!